Rare products of such a unique taste and the specific composition. Since when FA WHEY PROTEIN appeared on the market is simply snapped up by people who appreciate high quality and excellent taste of high-protein nutrients. 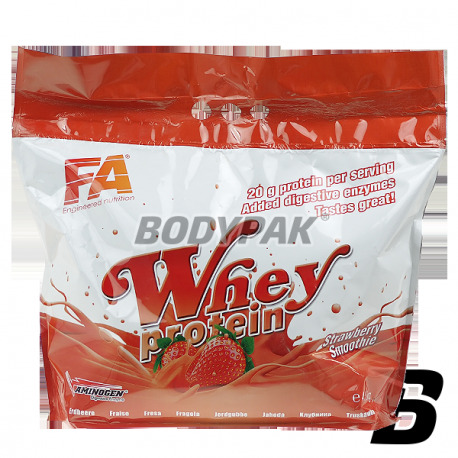 FA Whey Protein is a high quality protein drink prepared from high quality whey protein concentrate. All persons active physical accurately know that protein is one of the most important nutrients for them, especially for those using long-term strength training or endurance training. Proteins provide the body proper nitrogen balance, allowing maximum stimulation of anabolism and muscle recovery. 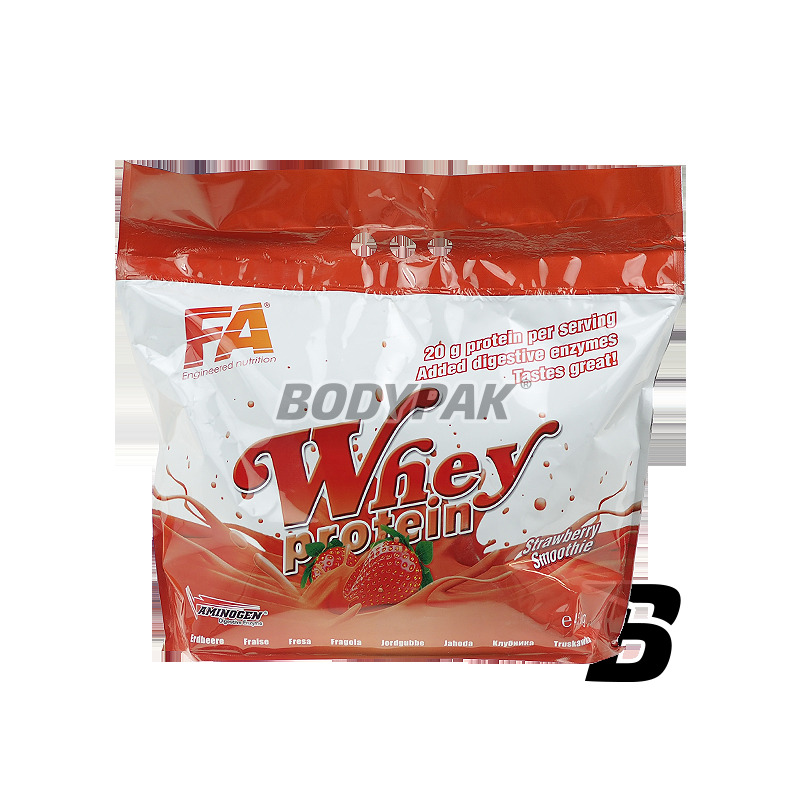 FA WHEY PROTEIN meets the daily requirement for protein delivery without lactose and cholesterol! Moreover, FA WHEY PROTEIN contains large amounts of glutamine (present as glutamic acid) than most protein beverage. Glutamine is a basic amino acid catabolic activity, the level is too low can result in injuries and muscle pain. Additionally, glutamine enhances secretion of growth hormone, which in turn stimulates production of insulin-like growth factor IGF-1, which stimulates the growth of the muscles of the body. It neutralizes the effect of lactic acid formed during intense exercise the muscles through the release of hydrogen and improves resistance during intense workouts. FA WHEY PROTEIN has been enriched with AMINOGEN® (patented digestive enzyme complex) to more effectively digest protein and thus help the absorption of amino acids in the body. As a result, the amino acids from FA WHEY PROTEIN quickly enter the bloodstream and are transported to the muscle tissue. Due to the fact that the FA WHEY PROTEIN has a very high rate of bioavailability (BV = 104) is needed for quick recovery of the muscles and optimal for protein synthesis. Ingredients: Whey protein concentrate flavors, a stabilizer (carboxymethyl cellulose), Sweeteners (acesulfame K, sucralose). High-quality conditioner based on whey protein concentrate (WPC) and soy protein isolate (SPI). Thanks to the 2 sources of protein obtained even better amino acid profile! The original taste and good solubility!